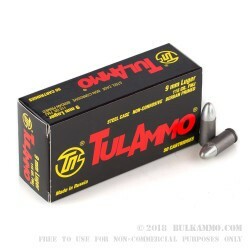 This 9mm Luger ammunition from Tula fulfills the needs of high-volume shooters at a great price. It fires a 115-grain bimetal FMJ round at 1150 feet per second, achieving typical 9mm Parabellum ballistics. Each box contains 50 cartridges, which use nonreloadable steel cases coated in non-toxic polymer for improved feeding and ejection. 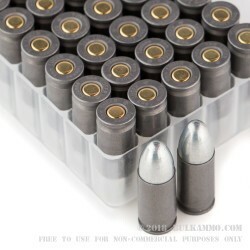 This ammo uses non-corrosive Berdan primers. TulAmmo is the brand of the Tula Cartridge Works, a longstanding Russian ammunition producer located south of Moscow in the city of Tula. The plant was established in 1880 in the Russian Empire; its first seven-year contract required the production of 210 million rounds of ammunition. Today, the plant’s capacity has grown to the point that its exports to the US alone exceed 500 million rounds annually. The Tula Cartridge Works has a long history of producing good steel-cased ammo, a major cost-saver due to Russia’s abundant iron deposits. It currently operates as a private company and exports to more than 20 countries in Europe as well as the United States. This is very nice for target practice. I ran about 450 rounds through it over a weekend, had one fail to eject that jammed in my barrel... had to field strip and push it out with a stick. Also when cleaning my Glock, there was white stuff in the rifling that would not come out, I spent 30 minutes scrubbing with Hoppe's gun cleaner and brushes... it is flaking off but still in there. I'm hoping that firing some copper through it will clean out the barrel. I used 3 boxes of 50 each. The pistol jammed 3 times. No misfires. Can't beat the price and quality. Wolf loses a 10 yera buyer!!!! Q: Is this ammo lead-free? A: Hello! 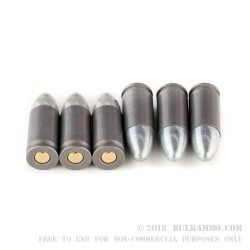 This Tula ammunition features a lead core, bi-metal jacketed projectile design. This round is not considered to be lead free. Q: Can you use this ammo in a ruger 9mm? A: Hello MRC, This is the correct caliber to use in your Ruger 9mm. You will want to check your owners manual or contact Ruger directly to see if they restrict the use of steel cased ammunition in their firearms. While it certainly won't hurt or damage the firearm, some manufacturers do have restrictions on steel cased ammo in their firearms.